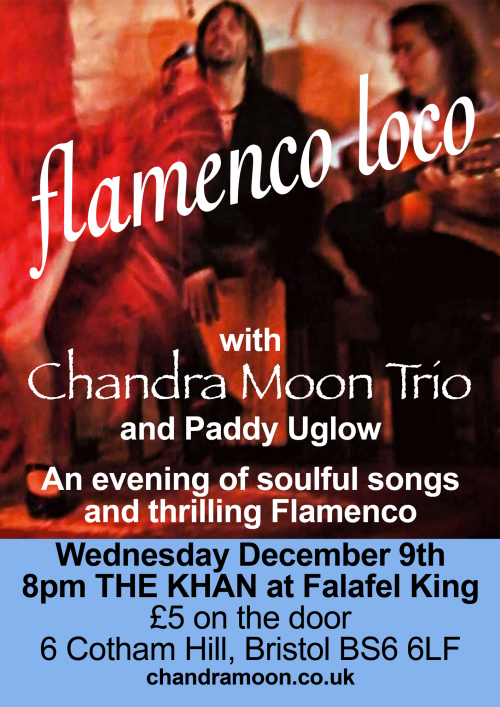 Great New Gig Coming Up Dec 9th! We’re putting on a gig here in Bristol on Weds, 9th December at 8pm at the Khan Bar at Falafel King, 6 Cotham Hill, Bristol BS6. For openers we have Paddy Uglow playing some of his original songs followed by a new set by Chandra Moon Trio featuring Paddy on keys/violin and Jimi Can on percussion. After the break, we’ll be treated to a fantastic and lively set from the brilliant Flamenco Loco. All this for only £5! Delicious food available upstairs as well – not to be missed!